The sounds of nature, a new listening of plants and trees. Connections cyclic installation / Version for 4 video projectors and 8 speakers. In the heart of the forest, my intuition guides me. I listen to the vibration of the moment in the murmur of trees. I watch the movements between beings, plants, animals and minerals, the time to be in tune. Watch the cooperation between the smallest and the gigantic, At the borders of the invisible, Make connections. Connections is a cathartic installation, an invitation to move one’s point of view and to look with new eyes on our ecosystem. The installation is now flexible, it seeks its shape in the cycle of the seasons. The spectator becomes the human element of this experience, repositioned his character in the world, immersed in the cyclical mutation of his environment. Solar Return is a set with variable geometry, composed of the duo Jenny Pickett & Julien Ottavi. 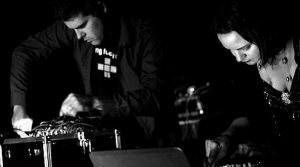 The body of their music is based on the generation of frequencies and the interpolation of multiple digital oscillators and analog modular synthesizers. Solar Return proposes an electric music and improvised noise. Electromagnetic phenomena are the starting point of their audio creations. They produced different scores for two audio synthesizers / oscillators / DIY electronics etc … that reflect electromagnetic models and events such as solar flares and the end of the mobile phone mast in town as well as the unfathomable audio world of kitchen appliances. Through their performances, the duo sneaks into the world of frequency, static and sound like a physical experience. 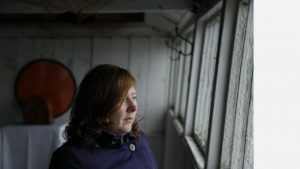 Magz Hall is a sound and radio artist whose exhibited at Yorkshire Sculpture Park, British Museum, Tate Britain, The Sainsbury Centre, Whitechapel Gallery, Barbican, V and A, Jerwood Visual Arts, MACBA Barcelona, Denmark, Italy, Germany, Norway, Morocco, Canada and the USA and broadcast internationally. Tree Radio at YSP was a finalist for British Composer Award in Sonic Art 2016 and was selected for the Jerwood Open Forest exhibition. Magz heads Radio Arts having curated works for exhibition, broadcast, and led numerous hands on workshops with the public in arts spaces. 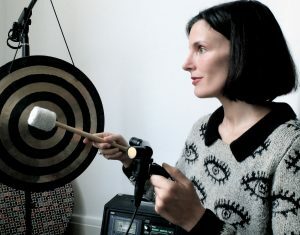 Much of her sound-based work is concerned with speculative futures of FM, inspired by 100 years of international radio art practice, drawing on her practice-based PhD ‘Radio After Radio: Redefining radio art in light of new media technology through expanded practice’ at UAL. In Norse mythology, Yggdrasil was an enormous ash tree that harboured all the life in the universe a signifier of its power and resilience. For the last ten years an Ash tree has propagated every available spot in the artists garden like a virile weed, she likens its resilience to radio which has already outlived video and the ipod. The artist believes her personal experience of the Ash tree highlights that it may not completely disappear as first feared by experts and this view is reflected in reports concerning the deadly fungus. 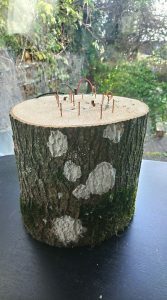 This work takes poetry made during a poetry workshop on Ash die back, turning scientific descriptions of how the disease spreads, into a spore like radio composition reflecting her interactions with ash, and transmitted from the trunk of an infected tree for broadcast on FM into the gallery. Opening of the exhibition at 6.30pm on Saturday, April 27 at the Intermédia Platform, 4 Boulevard Léon Bureau. Free admission from Thursday to Saturday from 16:30 to 19:30.